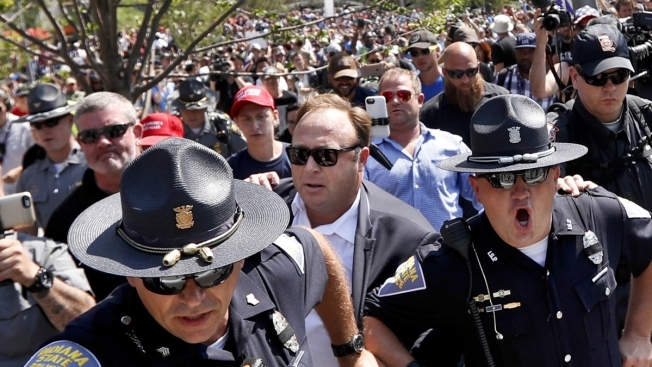 In this Tuesday, July 19, 2016, file photo, American conspiracy theorist and radio show host Alex Jones, center, is escorted by police out of a crowd of protesters after he said he was attacked in Public Square in Cleveland, during the second day of the Republican convention. "We take reports of hate content seriously and review any podcast episode or song that is flagged by our community," the company said in a statement late Wednesday. "Spotify can confirm it has removed specific episodes of 'The Alex Jones Show' podcast for violating our hate content policy," it said. Most "Infowars" Spotify content from Jones, an Austin, Texas-based radio host and conspiracy theorist, appears to still be available. Responding to the Spotify action on his podcast, Jones said it was "what I expect." "I was born in censorship. I was born being suppressed," he said.